By 2010 over 50 percent of the world's population, some 3.3 billion people, will live in urban areas. While cities offer opportunities for living with a low ecological footprint, they suffer environmental problems such as pollution, noise and remoteness from nature. Integrating vegetation into the urban fabric improves these quality of life issues, while offering many innovative opportunities for ‘green’ architecture. Whether part of a highly engineered wetland, or simply a low-tech way of providing dappled shade, plants can be a central part of a sustainable design solution. 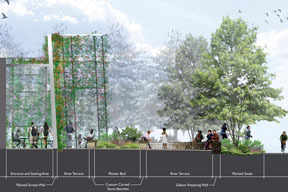 At the same time, they offer biophilic benefits to inhabitants, increase the ecological productivity of the site, and connect buildings with their unique local environment. We have moved beyond considering the attributes of a high performance building envelope just in terms of daylight, insulation and BIPVs, to incorporate rainwater collection, vegetation and even hydroponic food production. Now when designing a building, we evaluate each building surface for its best use and the value it can bring to a “productive building". Bronx Riverhouse with a double layer moss-vines wall. Vegetation can bring multiple benefits to the building envelope and mechanical and plumbing systems. Basic architectural strategies can include using evergreen vegetation as a buffer against prevailing cold winter winds. Evergreen vines on a wall trap an insulating cushion of air and reduce wind chill. 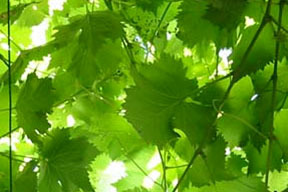 Deciduous vegetation can be used for seasonal shading, and also, through evapotranspiration, can cool the surrounding air. Depending on climate, well irrigated vines (preferably with gray or rainwater) can result in temperatures up to 10°F cooler than the surrounding air. A 10°F (5.5°C) reduction in the temperature immediately outside of a building can reduce the amount of energy needed for air-conditioning by 50 to 70 percent. Many sustainable architects have the benefits of xeriscaping (landscape that does not require supplemental irrigation) foremost in their minds. Although it is important to eliminate the use of potable water for plant irrigation, we consider all sources of wastewater that can be used. Irrigation can greatly increase the rate of growth of plants, their rate of evapotranspiration and their possible contribution to summertime cooling strategies. Using storm and graywater can also contribute to the stormwater management and waste water treatment systems. Vegetated roofs, facades and designed landscapes can allow downsizing or elimination of conventional plumbed stormwater systems. Especially important in areas with combined storm and sanitary sewers, this helps reduce overloading of the system with resultant overflows of raw sewage into nearby waters. Extensive green roofs (with 4 inch substrate) have been shown to retain 70 to 100 percent of summer rainfall and 40 to 50 percent of winter rainfall. 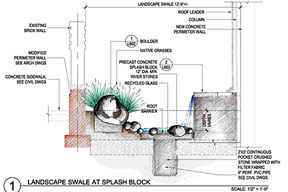 Designed landscapes such as bioswales, rain gardens and constructed wetlands purify stormwater and allow it to infiltrate into the ground to recharge the aquifers instead of entering a piped sewer system. Remsen Avenue incorporates a landscaped swale for stormwater infiltration. 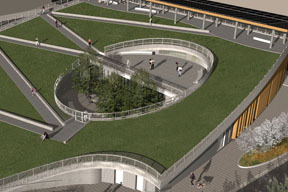 Solar 2 incorporates a raingarden to infiltrate excess stormwater and avoid any stormwater flowing to the combined sewer. More extensive purification of gray and black water can be done by biological wastewater treatment systems that use aquatic and wetland plants in conjunction with bacteria, algae, and other organisms. (Gray water is wastewater from bathing, hand-washing, dishwashing and laundry; black water contains sewage). A constructed wetland is an exterior system, and serves as an intermediate step between a septic tank and a drainfield, making pollution of groundwater less likely. An interior system treats gray and blackwater waste within planted tanks in a greenhouse space and may reuse the water for nonpotable uses (such as an “eco-machine” or a “living machine TM”). Solar 2, Green Energy, Arts and Education Center, will incorporate such an onsite intensive biological waste treatment system. When cities increase the amount of vegetation within them, reduction of particulates, pollution and carbon dioxide, and lessening of the urban heat island effect can be observed. A 2002 study in Toronto found that urban summertime temperatures in the city could be reduced by up 2 to 4°F if just 6 percent of the cities rooftops were greened. Plants, especially locally native ones, provide food and habitat for birds and insects, enhance biodiversity. The site can be made ecologically productive by sequestering carbon dioxide for the life of the plants (and beyond as carbon within the soil). Perhaps the most cost effective and rewarding benefit of integrating vegetation into buildings is the biophilic connection it gives to building occupants. Biophilia has been defined as "the connections that human beings subconsciously seek with the rest of life”. Studies have been done similar to those showing the benefits of daylighting to student learning in schools, retail sales or employee productivity. Views of plants have been shown to increase worker productivity, decrease absenteeism and reduce recovery times for patients in healthcare settings. Plants are part of the high quality environment that sustainable architecture should provide. As building technology improved throughout the 20th century the possibility of providing a uniform environment led to many buildings losing their vital connection with their environment. People are now beginning to question the desirability of that uniformity. Many opportunities for richness and meaning come from connecting a building to its environment, animating architecture through the play of daylight on a wall, the passing of a breeze, or the variety of light, shade and color that plants can give. Human food production within buildings or on rooftop greenhouses is also a possibility. The ecological cost of transporting food thousands of miles from farm to table is huge, and indoor urban agriculture allows food production year round for local consumption. Green roofs include thin ‘extensive’ green roofs (2 to 6 inches), thicker ‘intensive’ green roofs (typically an accessible roof garden) or removable modular green roofs. Extensive green roof plants are typically sedums and other rocky alpine plants as they can tolerate extreme conditions and are virtually maintenance free. Intensive green roofs can support a much larger variety of plant species. Although some green roof systems incorporate a rainwater detention layer, many green roofs will need supplemental irrigation, which can be provided by graywater or stored rainwater. 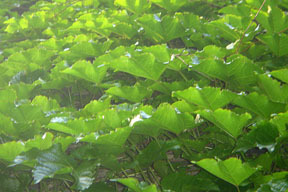 This can be dispersed by a drip irrigation system, or by a layer of felt below the surface and irrigated from one edge. A well irrigated green roof can keep the roof much cooler throughout the summer than a dry green roof. Green facades or screens (vines climbing up screens /walls) can be vine covered. Trellises can keep vines largely within designed areas and can be placed in front of glazed areas, allowing deciduous vines to provide seasonal shading of the interior spaces. Climbers may be self-clinging or they many need supports. Certain climbers require certain types of supports – some twine around trellises, or vertical or horizontal supports while others have suckers or aerial roots to attach to walls. Steel cable or strong plastic meshes can be used as the support for vines. Solar 2 is on a narrow North-South site, meaning long east and west facades are unavoidable. The design suspends a vine screen to the east, and a wall clinging deciduous vine to the west, to shade the building’s vulnerable windows in the summer and yet welcome the sun’s warming rays in the winter. 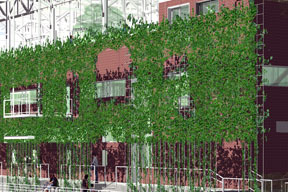 Bronx River Greenway Riverhouse combines seasonal shading through vines with a security screen for the project. can be planted with mosses, or plants in pockets of the walls to form a green wall. Retaining walls can also be made up of modules that have space for planting. Designed green wall systems may have soil held in compartments, but the most successful ones are hydroponic – where bare roots are kept moist and irrigated with a nutrient solution. 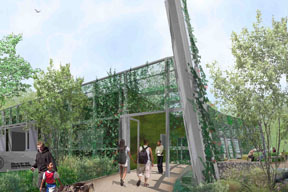 In the Bronx River Greenway Riverhouse project a rainscreen on the AAC block wall is covered in mosses, while an outer screen is covered in vines. This will result in local cooling of up to 7°F and mimics the ecological productivity of a temperate rainforest. Successful integration of plants into buildings and their systems requires a team approach. Maintenance requirements need to be considered from the outset. The client, landscape architect, architect, structural engineers, civil engineers, mechanical, electrical, and plumbing engineers and an ecologist may all need to be involved. Most of these team members are not used to designing with regard to time. When integrating vegetation into buildings architects need to be aware how their design will look in each season and before and after the optimal growth period. It is very easy to think of vegetation as another building material that can be used in any orientation, exposure or size. Plant textures applied to renderings can seduce the architects and clients into thinking that this is possible, and the real world installation may well fall short of expectations. However, many built examples show that where a team member has close knowledge of plants and their requirements, and the whole team works together to make the installation a reality, then incredibly lush, verdant installations can be created. An ecological approach calls for the use of native plants in exterior locations (Indoor plants will normally be tropical or other warm weather plants, since the indoor environment is always warm). Native plants offer many advantages, link to the region, and greatly increase the available habitat for animals. Adapted, or non-invasive plants may also be considered, but it is worth considering the level of ecological productivity and animal life supported by native plants can be orders of magnitude higher. A holistic sustainable approach to design offers many synergies. Using plants to treat wastewater increases their growth and possibilities of summer time cooling. At the same time it increases biodiversity and habitat. Studies have looked at combining photovoltaic (PV) and green roofs and found that there may be benefits to both – the PVs are more efficient since they are kept cooler and the green roofs benefit from some shade. However, there will be situations where tradeoffs need to be made. With productive buildings the whole building skin becomes a precious opportunity to harvest environmental benefits, such as whether a surface should be clad in solar panels, vegetation or glazed. The design team needs to think of the whole picture, and measure advantages and priorities, while avoiding token gestures of greenness.